Many people feel making a shirt is a step too far beyond sewing a top or blouse. But there’s a good variety of support available, so it can be worth going for ! 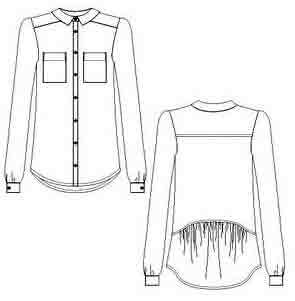 These are sew alongs which give detailed extra guidance to supplement the shirt pattern instructions. Some of the sewalongs also include a classic ‘tower / steeple’ shirt sleeve placket. The free written tutorials are linked to specific patterns. But most of the on-line videos and DVDs are not pattern specific, though they make pattern recommendations. The classic shirt has such standard features that the Big 4 pattern companies all have several basic shirt patterns for women. Kwik Sew are particularly known for their men’s shirt patterns. This is Kwik Sew 3883. As usual, I haven’t read or watched through all of these sewalongs, let alone worked through them – so no guarantee about quality ! This isn’t a shirt, but it has a collar band, so I’ve included it here. Easier than making a two piece collar – perhaps a good starter piece ?! There’s even a ‘chat and encouragement’ group at Pattern Review, for people who promised to sew one of these a month for a year ! Oh, this pattern doesn’t actually include a collar stand, ah well. . . This pattern was one of the challenges in the Super Online Sewing Match. Here are the Entries, which all show creative options (one of them added a collar band, which is what confused me !). 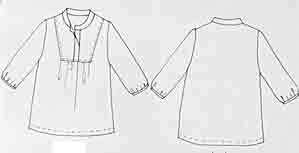 They use their own pattern draft for the shirt, but you could use many other patterns. Instructions also apply to making a woman’s shirt. 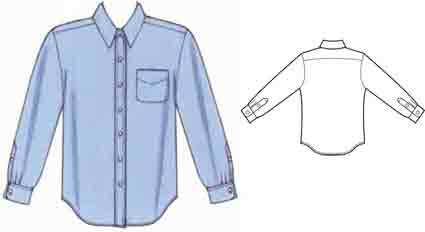 The latest version of the Palmer-Pletsch unisex shirt pattern is McCall’s 6613, with sleeve, hem, pocket options. Level 6 of their sewing course. The course is cumulative, Level 6 is not stand-alone, it assumes you know all the skills taught in previous levels. sewalong : Level 6 teaching DVD (scroll down). This entry was posted on October 19, 2013 at 9:11 am and is filed under sewing technique. You can subscribe via RSS 2.0 feed to this post's comments. Both comments and pings are currently closed. The only problem with the Palmer Pletsch pattern is that the sleeve seam is placed in line with. The cuff placket. I understand that this is for ease of construction, but it means that you can’t insert the sleeve ‘flat’. I have redrafted the sleeve so that the sleeve seam is in line with the side seam. Also added a tower placket, so the whole thing looks like a RTW shirt.